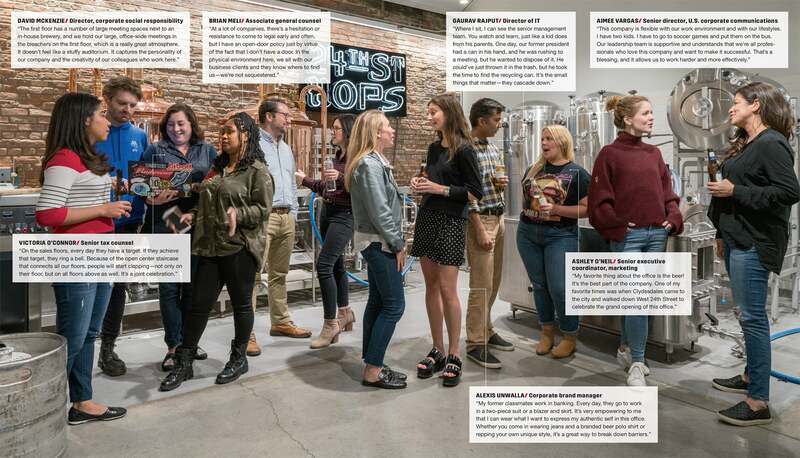 The casual workplace culture keeps the beer giant’s staff happy and collaborative. Anheuser-Busch occupies an interesting space in beer. The maker of Budweiser was once America’s dominant beer producer, known for its St. Louis roots. Then it became a subsidiary of the Belgium-based AB InBev, the world’s largest beer company. As the beer industry shifts – with craft makers on the rise, and more drinkers moving to wine and spirits — it’s been experimenting with its own brands and buying up others (like Goose Island). And its new, eight-story commercial strategy office in New York City’s Chelsea neighborhood signals the company’s desire to stay nimble despite its size. The space is designed by TPG Architecture and contains many features straight out of the tech-startup design playbook: a central staircase meant as much for congregating as traveling, and many carved-out spaces for staffers to quickly discuss everything from liquid innovation to new marketing campaigns. Of course, beer is served fresh from its in-house brewery, called 24th St. Hops.